In every neighborhood there are those culinary establishments that despite hell or high-water come to represent the past, present, and future of a neighborhood for residents. Venezia is one of those places. It is undeniably a neighborhood institution, offering diners from all over the world but most importantly New Orleans, the opportunity to sit in a place where thousands of New Orleanians have sat before, to enjoy heaping portions of traditional creole Italian fare. For roughly 30 years, Venezia was owned and operated by Anthony Carollo since 1957. Anthony Carollo was the son of the infamous New Orleans’ mob boss Sylvestro “Silver Dollar Sam” Carollo. This remains an important part of Venezia’s history as customers frequently discuss the place as a former mob hang out as they enjoy their heaping plates of spaghetti and “red gravy”. In 1987 the property was sold to the current owner Anthony Bologna, who was responsible for the post-Katrina renovations and reopening. Venezia is more than just a neighborhood pizza restaurant although they do bake a delicious Sicilian style pie. It is a neighborhood anchor that since the late 1950s has attracted other food oriented businesses to the area, beginning with its neighbor Brocato’s. When interview Mid City residents about what they perceived to be the draw of Mid City to New Orleans eaters, Venezia is nearly always at the top of the list. It is a restaurant that cooks up nostalgia for New Orleans residents everyday. On the spectrum of creolization-Americanization, Venezia is the opposite of Domino’s. Diners at Venezia spend hours supping and drinking delicious house wine. The idea is to savor the food and savor the history of New Orleans with every bite. I find the fact that Venezia is still bustling nearly every night of the week an excellent sign that despite their new neighbors (Pei-Wei, Five Guys, Felipe’s, Panera) New Orleanians are still willing to enjoy the slower more traditional things in life. A Slice of Mid-City: Part IV- What do you know about Banks Street? In addition to the plethora of pizza offerings on and around Canal and Carrollton, Banks Street is booming with both tasty handcrafted pizza and amazing brunch offerings. Both Mid-City Pizza and Crescent Pie & Sausage Company , similar to their neighbors Katie’s, Wit’s Inn, and Theo’s offer tasty, New Orleans-style pies in addition to a comfortable place for patrons to come and hang out. Just one year ago, Mid-City said goodbye to longtime pizza spot Lazaro’s and hello to Mid-City Pizza, which bakes up my favorite pizza in the neighborhood. Located at 4413 Banks St, Mid-City pizza is also accessible through Banks Street Bar, a great neighborhood dive and music venue. From a small window in the back of the bar, patrons can order pizza by the pie or slice, to compliment the cold beer on tap. Again, the expansion of hangout space is huge in New Orleans eating and drinking culture and is a crucial part of any neighborhood pizza spot. In addition to the relaxed vibe, Mid-City Pizza also presents some innovative pies including on Monday the Red Beans & Rice Pizza. Just across the street from Mid-City Pizza is another New Orleans pizza place sister to nearby pizza-neighbor, Pizzicare on Tulane Ave. just a few miles down the road. This place, while specializing in homemade sausages and tasty sandwiches, offers diners delicious New Orleans inspired pizza options too. With choices like the Duck & Brie pizza and the always classic Marguerita, Crescent Pie & Sausage seeks to create gourmet pizza from fresh local ingredients, fusing New Orleans culinary artisanship with modern pizza flare. All of their sausages and many of their cured meat toppings are made in house. Both of the places fuse New Orleans style ingredients with classic pizza recipes while also offering comfortable, no-rush benches and tables to relax and enjoy good food with good friends. 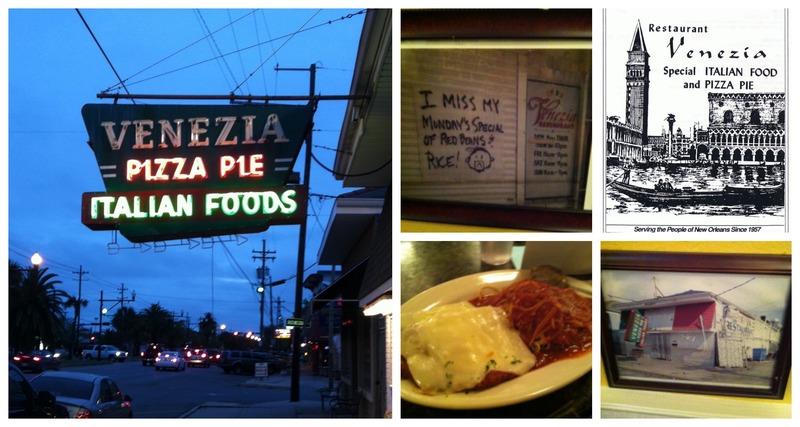 These elements, seen especially through the lens of pizza in Mid-City are crucial parts of life in Mid-City and in New Orleans in general. Further down the spectrum from creolization-to-Americanization lay Mid-City’s finest neighborhood pizza joints: Wit’s Inn, Katie’s, and Theo’s as well as Mid-City Pizza and Crescent Pie & Sausage Company, which will be discussed in the next post about Banks Street’s recent redevelopment. Each of these locally-owned Pizza restaurants have on their menus items that are unmistakably New Orleans. 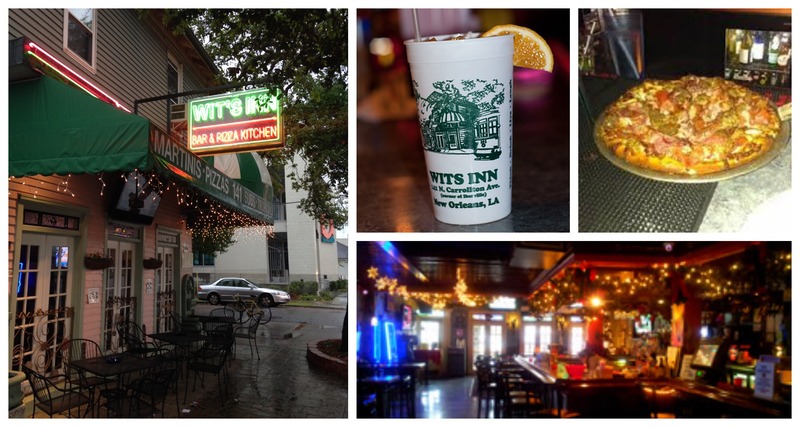 Wit’s Inn, located at 141 N. Carrollton Ave, is a neighborhood bar and pizza kitchen. According to research done in 2012 by UNO undergrads, Wit’s Inn is owned by Dennis Schuerman and has occupied its current space since 1995. Prior to this the building had housed a pool hall in the 1970s and as early as 1937 is listed on Sanborn Maps as a restaurant although further details could not be discovered. So what makes Wit’s Inn’s pizza representative of Mid-City and New Orleans? The first thing, is the space. During the course of this research project, I spent many hours observing individuals at Wit’s Inn. It is a place where neighborhood folk come to hang out for hours on end. Wit’s Inn’s pizza topping options also representative of New Orleans. With tasty options like the Muffuletta, the BBQ Shrimp, and the Creole Italian Pizzas it is hard to imagine toppings that are even MORE New Orleans. Katie’s approached pizza in a similar way, offering diners options like: The Iberville with “grilled eqqplant, fresh spinach, red onion, fresh basil, feta, and our garlic butter cream reduction”, The Atchafalaya featuring “roasted garlic, sautéed shrimp, oysters, and crawfish, crabcake, tri-colored bell peppers, tabasco, and marinara”, and The Boudreaux with “cochon de lait, roasted garlic, fresh spinach, red onions, scallions, and garlic butter cream reduction” (http://www.katiesinmidcity.com, 2014). And Theo’s also presents pizza in the same way offering neighbors from Mid-City a place to sit, hang out, and gobble-down some of their favorite New Orleans-esque toppings. When asked: “What makes Theo’s a New Orleans restaurant?”, one waitress commented that it was the people that come there. She told me that she enjoyed her job there because she was familiar with most of the people who frequented the restaurant. “It’s my friends and my neighbors and all the other folks who work in Mid-City that I see all the time coming in here.” (Fieldnotes, 3/26/14). This is an important sentiment that the young waitress expressed. Perhaps part of what keeps the Mid-City’s restaurant row embedded in New Orleans culture and ideology are the vast number of locals that frequent these places, as opposed to a neighborhood like the French Quarter. It is undeniably observable that the national Pizza chains in Mid-City fail to maintain a space for patrons to come and hang out, grab a drink, and eat some pizza with friends while ALL of the locally-based Pizza joints do. In my investigation of Pizza in the Mid-City neighborhood, I found that despite a healthy smattering of local neighborhood pizza places, it also is categorized by a generous offering of national Pizza restaurants as well, which are interestingly all located in very close proximity to one another. 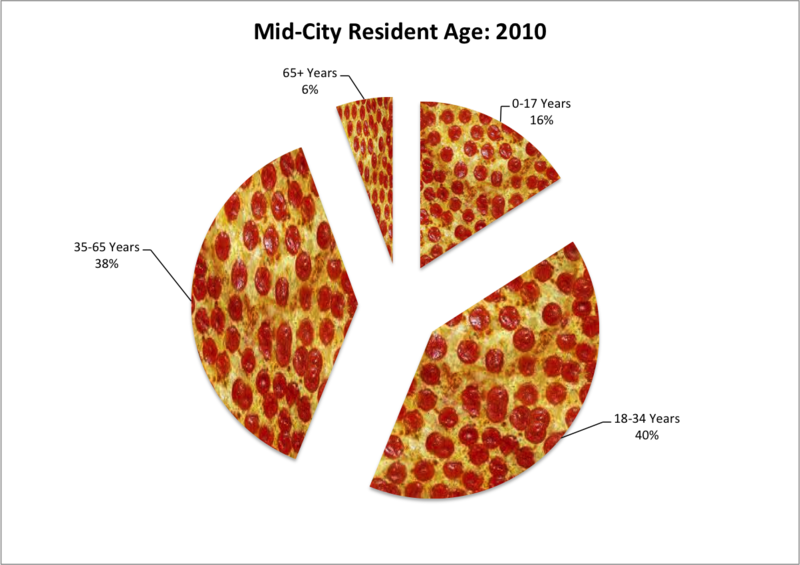 According to national market research, national chains take only 35% of the pizza market share in the United States with the majority of business going to smaller local pizzerias, which also abound in Mid-City. Pizza Hut, Papa John’s Pizza, and Domino’s Pizza are conveniently all clustered around the intersection of N. Carrollton and Bienville Ave and have all joined Mid-City’s Restaurant Row rather recently. Domino’s was the first to open its doors in 2007, followed by Papa John’s in 2012 and most recently Pizza Hut in 2013 with the opening of the new Mid-City Mall. Domino’s, Pizza Hut, and Papa John’s have very similar business models, which keeps them in close competition for their share of the Mid-City pizza market. Domino’s Pizza is the leader amongst pizza chains with regards to online and mobile ordering and delivery. This is reflected in the built environment of the Domino’s located in Mid-City. With several reserved parking spots and very few tables inside the actual restaurant, it is clear that Domino’s is catering to the Mid-City take-out crowd. Its location right on N. Carrollton Ave, puts it perfect position for commuters looking for food on their way home. Because of its diverse menu options (pizzas, sandwiches, pastas, chicken, and flavored breads), Domino’s as a corporation, has seen consistent growth over the last decade, despite its inability to respond to consumer demand for more healthy choices. Domino’s main focus for growth according to a 2013 SWOT analysis is expanding into emerging markets in India and China. This is a sentiment shared by most fast-food restaurants not already engaged in those markets. Domino’s employees and management at the Mid-City location continuously declined interviews and thus a deeper look into this particular location was impossible. Papa John’s moved to its Mid-City location in 2012 following the shuffling of several business that shared space within the strip mall. Prior to Katrina, the space currently occupied by Papa John’s was first Sounds Warehouse Music and Movies, which was bought out by Blockbuster just months before the neighborhood’s devastation. Similar to the Domino’s located just across the street, Papa John’s Pizza has easy access to reserved parking. It too has limited dining facilities inside the building and thus also caters to the take-out eaters of the neighborhood and surrounding area. Unlike Domino’s, however, Papa John’s offers only the most basic pizza options and are known mostly for their garlic butter dipping sauce which accompanies every pie. 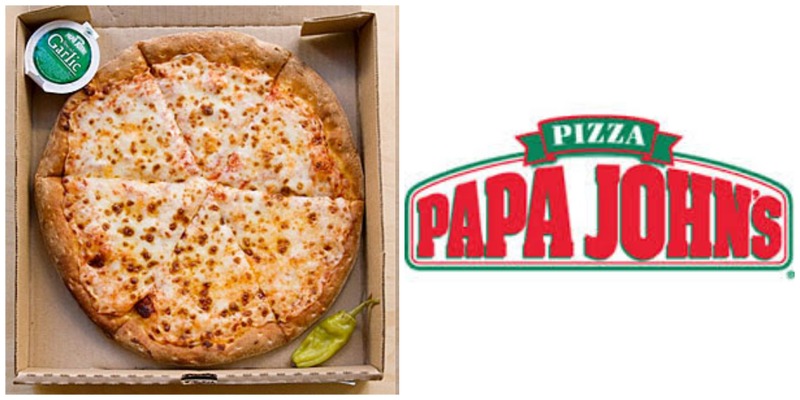 With 4,200 locations, Papa John’s is the smallest of the national pizza chain restaurants present in Mid-City. Similar to Domino’s, however, Papa John’s employees and management were also unenthusiastic about answering questions and sharing their thoughts on the role and relevance of their restaurant in the Mid-City food cluster. 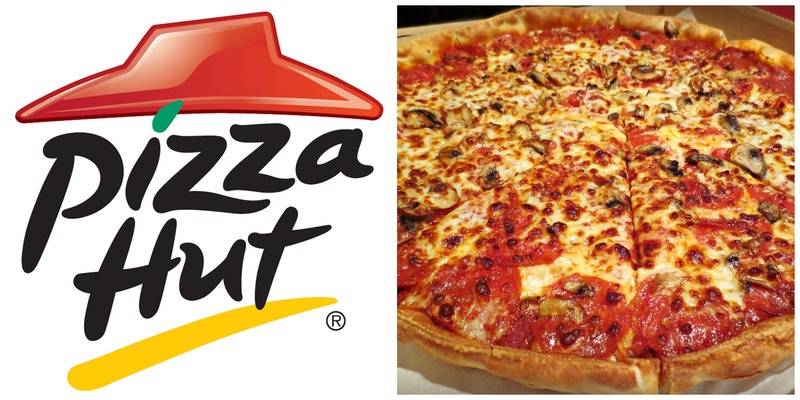 Pizza Hut is the largest global chain represented in the Mid-City neighborhood of New Orleans. The fast-food pizza chain boasts more than 20,000 franchises all around the world and although in their 2013 SWOT analysis, they recognized consumer satisfaction with their pizza is in decline, they chain continues to seek out new ways to stay competitive. Part of this strategy includes WingStreet, a major marketing strategy of the Mid-City location, especially during Saints Football Season! WingStreet is a menu of chicken wings available at most Pizza Hut locations. A similar challenge faced by competitors Papa John’s and Domino’s Pizza Hut has struggled to adjust to the increase in public awareness around the adverse effects of eating high fat/high calorie diets, like pizza. As a business model Pizza Hut can not compete with the fresher and sometimes more local ingredients that other neighborhood pizza chains such as Theo’s and Crescent Pie & Sausage Company offer their customers. The reality that these three chains have come to Mid-City in the post-Katrina context is not surprising. This kind of business development is a trend that can be seen all around the city, from the stirrings of a Chipotle opening on Magazine Street to the commodification of New Orleans culture seen throughout the French Quarter. Due to the physical and economic devastation that hurricane Katrina brought upon the City of New Orleans, locally-based business faced competition from national corporations that were left unscathed. These businesses represent one extreme of the creolization-to-Americanization food culture spectrum. The food is predictable, available quickly, affordable, and familiar to people all across the world. 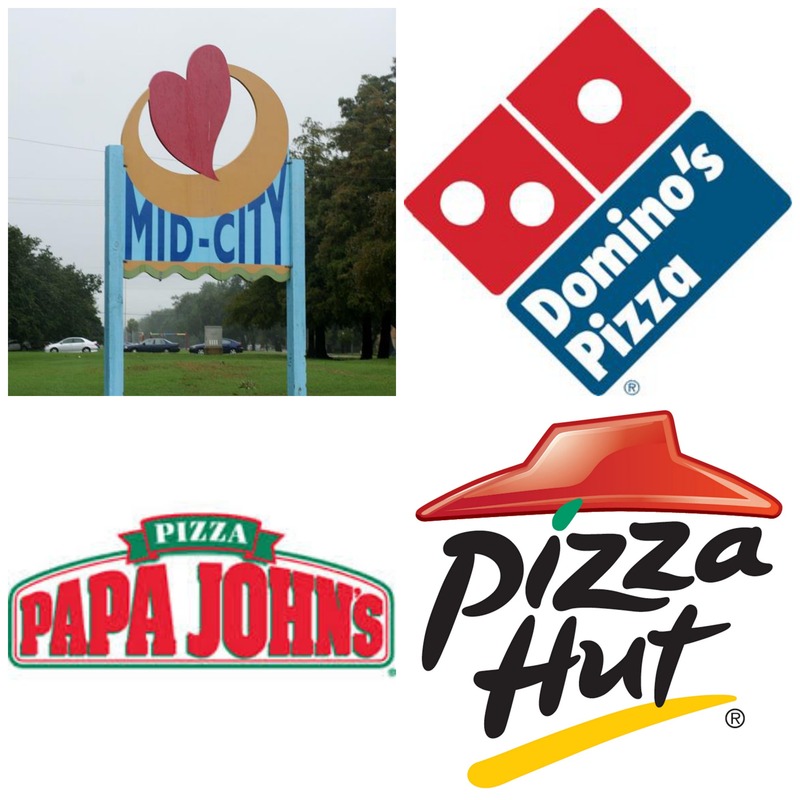 These pizza chains represent a tension that can be seen throughout the city of New Orleans because of their proximal competition with local chains. Pizza Hut, Papa John’s, and Domino’s represent the highly-Americanized end of the spectrum and as a result appeal to a limited audience. 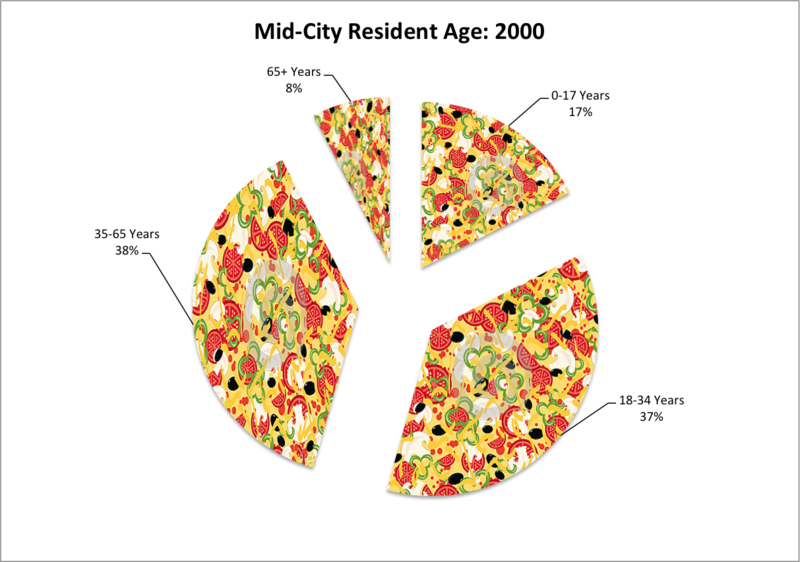 In addition to my discussions of how the wide range of pizza available in Mid-City reflects some of the growing cultural and ideological tensions in New Orleans, I offer up here a quick look into the demographic changes the neighborhood has undergone since Hurricane Katrina. Mid-City is a rapidly changing neighborhood and while the last ten years have seen a lot of change, demographics are slow to change. The charts below may offer readers a more in-depth look into some of the neighborhood demographic information. All data was taken from The Data Center. 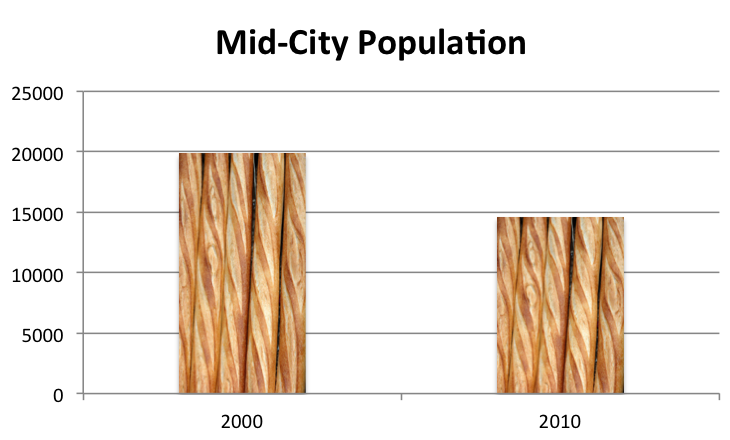 Mid-City experienced substantial population loss due to hurricane Katrina, with some parts of the neighborhood experience peak flood depths of up to 8 feet. 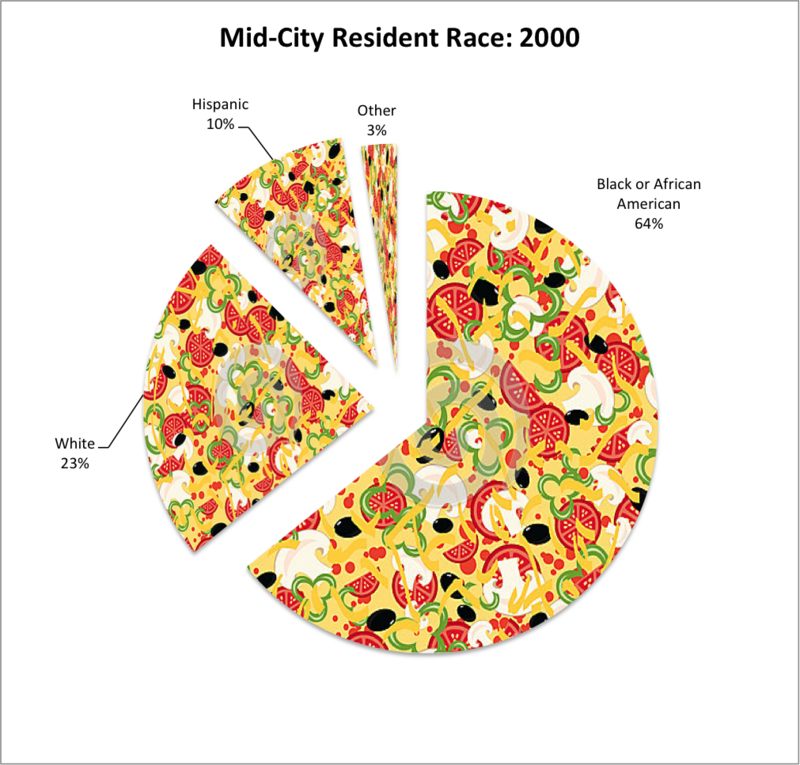 Although the distribution of ages and races represented in the neighborhood remained relatively consistent before the storm and after, the neighborhood has yet to recoup it’s pre-Katrina population numbers. This may soon change, according to Preservation Resource Center of New Orleans, Mid-City is one of the fastest-rebuilding neighborhoods since the storm. 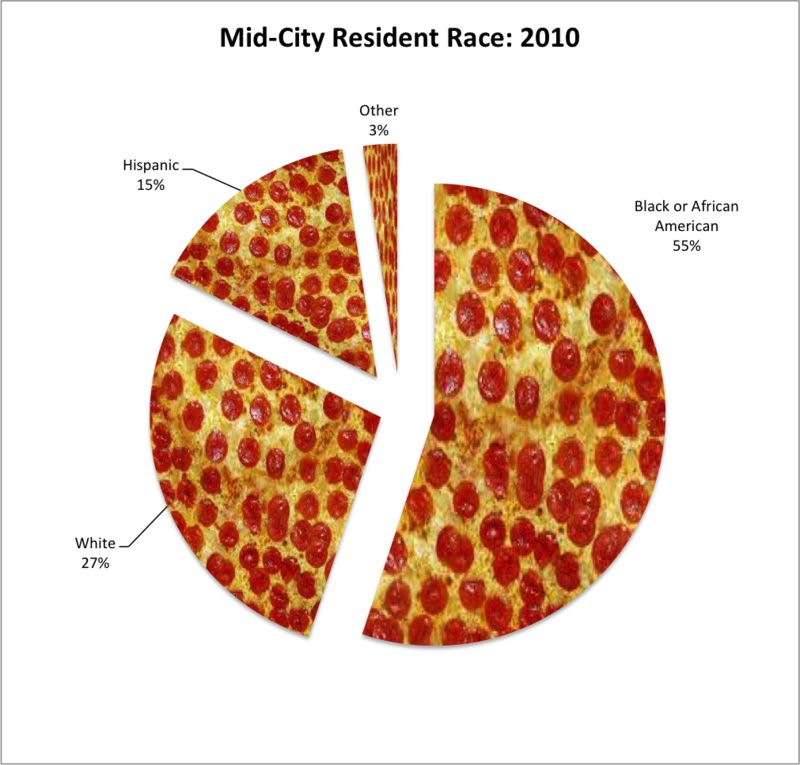 We can see from these Pizza-pie charts that the Hispanic population is the fastest growing in Mid-City. This can be seen in the large number of hispanic owned and operated food businesses on Carrolton. Since August of 2013, Mid-City has seen an influx of national chain restaurants on S. Carrolton. In addition to these chain business the neighborhood boast an attractive location for locally owned businesses as well. This rapid growth of food oriented businesses to the neighborhood stands as proof to the testament that Mid-City plays a major role in supporting New Orleans’ food culture! The origins of the delicious modern staple are somewhat in dispute. While some historians point to the existence of brick pizza ovens in pre-Vesuvius Pompeii as early as 79 A.D., others argue for its origins as a peasant food in Naples in the late eighteenth century as baked flatbread with tomato toppings. Regardless of when pizza may have been born, it began it’s trek to the North American continent through the hearts and hands of Italian immigrants. These Italians settled all over the country including right here in New Orleans. Since Pizza debuted in New Orleans in the French Market, courtesy of Sicilian immigrants in the 19th century, it has undergone a diverse array of transformation that are reflective of the transitions New Orleans herself has undergone. As Dr. Beriss mentions in his introduction to our Spring 2014 research, many of these changes reflect a tension between creolization and Americanization of New Orleans food and culture. Mid-City is a neighborhood rich in pizza and is perhaps one of the most pizza-saturated neighborhoods in town. As of April 2014, there are total of 9 Pizza-serving establishments that currently sling pies to the neighborhood’s pizza-gobbling residents. These establishments run the gamut from traditional Italian-style pie to unique New Orleans inspired pizza, boasting familiar creole flavors in a whole new context. In the posts that follow, I aim to give readers an in-depth look at Pizza in Mid-City and how it reflects the unique blend of people who are coming together to build and experience New Orleans’ unique culture. I will discuss some of the tensions between locally owned Pizza restaurants and national chains as well as where the various establishments fall on the creolization-to-Americanization spectrum.